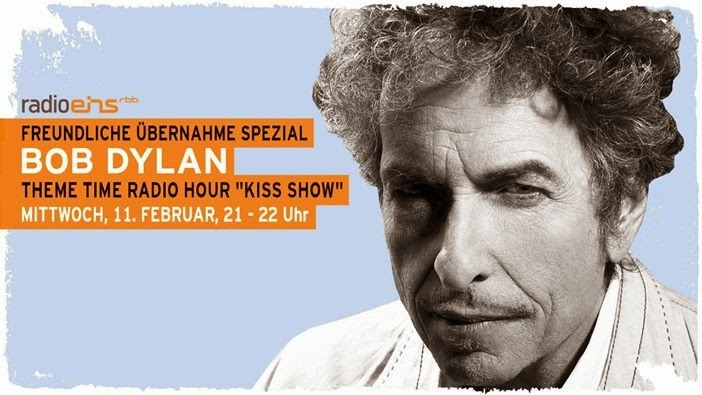 Dreamtime - Commentary Inspired By Bob Dylan's Theme Time Radio Hour: K Blows Top! "To me, the first lesson of being subversive is, don't tell people you're being subversive." ~ Eddie Gorodetsky, The Los Angeles Times, December 10, 2000. Our Host: Oh, we have a first-time caller. Am I supposed to pick up Line 1? Our Host: Hello, caller. What's your name? Lamont: My name is Lamont Dween. Our Host: Where ya calling from, Lamont? Lamont: I'm calling from Silver Lake, California. Our Host: Well, that's good. We're doing our California show today. Lamont: I know you are, I've been listening. Our Host: We're going to look for that record for you. What's your question? Lamont: Isn't there a famous Nikita Khrushchev quote about automobiles from the Cold War? "Whether you like it or not, history is on our side. We will strangle your cities with traffic. We'll draw you into fighting useless wars. We'll send in developers to ravage your land and replace your individual farms with corporations. We will force your citizens into the slavery of credit card debt. We'll send gangsters into your schools to sell your children drugs. We'll replace each of your meals with empty junk food. One way or another, you'll see who comes out on top." Our Host: Thanks for your call Lamont, and keep listening. * Lest anyone think I've gone typo-blind, Thee Midniters did spell the article preceding their name with an extra "E." This was not because they were especially religious or old-fashioned, but because they were wary about having their asses sued off by another band frequently mentioned on Theme Time, Hank Ballard and the Midnighters. According to Wikipedia, the conceit started a minor craze of similar misspellings among East L.A. bands, including Eddie Serrano and Thee Enchantments, Thee Headcoats, and Thee Hypnotics. Our Host: Tex is holding up a sign. Got a caller on Line 2. He says it's Lamont? But I think we already talked to Lamont. Lamont, is that you? Lamont: Yeah, it's me again, Lamont. Thanks for playing "Whittier Boulevard" for me. Lamont: Boy, it's rilllly heavy what Khrushchev said. Our Host: Yeah, wasn't it? Lamont: I can't believe they don't teach that side of the Cold War at school. Our Host: Well, that's the educational system at work. Lamont: Did anyone record what Nixon's reaction was? Our Host: The two squared off, neither willing to give an inch. According to reports, someone banged their shoe on the table, but it's unclear which of the two. Lamont: Wow! It's like you always say Bob, the show is not only entertaining but informational. Our Host: Well, we try, Lamont. Lamont: Thanks again, Bob. Keep rockin' in the free world! I recently finished Peter Carlson's wonderful book about Nikita Khrushchev's bizarro road trip across the United States in 19 and 59, K Blows Top. Whether you lived through that era or not, I highly recommend K Blows Top as a delightful history of a time that seems to get both stranger and more familiar as it recedes away from us. During the height of the Cold War, Nikita Khrushchev wrangled an invitation to visit the U.S. from an unenthusiastic Dwight D. Eisenhower. Taking a two-week jaunt across the country, the Mighty K. insulted and was insulted by a variety of local pols, hobnobbed with Hollywood luminaries including Marilyn Monroe and Shirley MacLaine, visited farms and auto plants, and shook hands and kissed babies as if he were running for President himself. He was also barred from Disneyland, and sometimes threatened to start an atomic war when he was tired or in a bad mood. The closest equivalent today would be if North Korean Supreme Leader Kim Jong-Il suddenly appeared in New York City and set off on a whistle stop tour of America, sampling corn dogs and having a brew at the local watering hole with the boys while holding the occasional news conference to point out that he had rockets capable of hitting California and might just use them. Washing Machines, Da! Rockets, Nyet! K Blows Top reminded me of Our Host's equally surreal recounting of the kitchen debate during the "California" episode of Theme Time Radio Hour, a history lesson which I doubt was taught in either the Rhode Island or Minnesota school systems to producer Eddie G. or deejay, Mr. D.
For those not familiar with the background, there was indeed a kitchen debate between the two which took place three years later than Our Host stated, in 19 and 59, in a "typical American tract house" set up for a trade fair in Moscow. 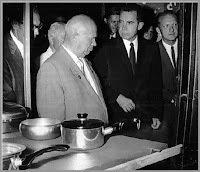 During the pair's tour, Nixon led Khrushchev into the model house's kitchen, extolling the benefits of its modern appliances. An unimpressed Nikki K. replied "We have such things" and, typical for the Soviet leader, decided to take Nixon's remarks as a grave insult to the Soviet people as a whole. The two squared off on Communism versus Capitalism for several more minutes, covering everything from who built the better washing machines (point to the U.S.) to rocketry (point to the U.S.S.R,, which had recently hit the moon with an unmanned rocket. Ours, in contrast, kept blowing up), to who was making ultimatums to whom (point to no one since both sides were). There was no discussion of the Soviets drowning our cities in consumer goods or credit card debt. Khrushchev always claimed the translation had been mangled, once relating that he had meant that America's working class would bury capitalism, another time saying that he had been referring to a Marxist joke, "a capitalist would sell the shovel to dig his own grave." But "We will bury you!" is the quote the Chairman is remembered for. Khrushchev is also remembered for his "banging of the shoe" which Our Host obliquely refers to in his second conversation with Lamont. The incident - or maybe "performance" would be the better term - didn't happen in either 1956 or `59, but in October 19 and 60, and didn't involve Richard Nixon but instead the full General Assembly of the U.N.
A pugnacious K., inflamed by the Gary Powers' U-2 affair and wanting to impress Third World nations with the U.S.S.R.'s commitment to stand up against that ol' debbil imperialistic America and its running dog lackeys, flipped out when a Filipino delegate suggested that maybe the Soviets, for all their fuming about imperialistic colonialists could themselves be considered "the greatest colonial power in the world." And howza 'bout that Hungary and Czechoslavkia, anyhoo, Nikki? How do you like dem apples, huh? "Enraged, Khrushchev jumped up again, his face beet red," Peter Carlson relates in K Blows Top. "He had something in his hand and he waved it like a club. It was his right shoe, a tan loafer. For a moment, Washington Post reporter Murrey Marder thought Khrushchev was going to throw it at the podium. But he didn't. Instead, the premier sat down and began banging the shoe on his desk. His first blows were mere taps, but then he pounded harder and harder, louder and louder. Soon the other delegates were turning around, craning their necks to see who was making such a racket." Khrushchev never explained what had inspired him to bang the shoe, but it became a signature gesture, forever after to be associated with Nikki the K. Many in the Soviet delegation were embarrassed, although they all dutifully banged their shoes along with their Premier. The U.N. was officially outraged. The media was alternately amused and frightened in their reports, given that this, this, this seeming buffoon prone to throwing temper tantrums also had a nuclear arsenal at his disposal. As Carlson notes, "...the phrase 'Khrushchev banging his shoe' conjures up such a vivid mental image that many Americans believe they watched the event on television." I'm one of those Americans. Even though I was only eight years old at the time, I can close my eyes and see Khrushchev - in fuzzy black-and-white - slamming that shoe on the table. What I'm actually seeing is a fantasy image, maybe brought on by the dread of being fried to a radioactive krispy kritter at the tender age of eight by this guy who looked like somebody's grandfather. Carlson goes on to point out that not only was there no video of the banging of the shoe, there's not even a still photo of the banging. (the photo above, which circulates on the Web as from Look magazine, is a Photoshopped fake). 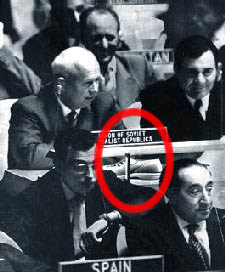 The closest thing we have to a photo of the shoe banging is a UPI picture of the shoe quietly sitting in front of Khrushchev's U.N. nameplate. There's some controversy about whether there even was a shoe-banging incident. In a 2003 editorial in The New York Times, William Taubman expresses doubt that it ever happened. "According to [a Times reporter], Taubman writes, "Khrushchev leaned over, took off a slip-on shoe, waved it pseudomenacingly, and put it on his desk, but he never banged his shoe." And a photographer from Life, who was covering Khushchev's visit, notes, "...I can assure you that every camera in the booth was trained on Khrushchev, waiting for him to use the shoe. He only put it on again and left. None of us missed the picture — which would have been a serious professional error. The event never occurred." Shoe-banging or no shoe-banging? Proof is lost in the mists of history. Speaking of the the mists of history, just what did Eddie Gorodetsky and Bob Dylan mean by their fractured retelling of the kitchen debate? It wasn't the first or the last whopper Our Host would tell on Theme Time Radio Hour. In various shows he opined that all the presidents except Jimmy Carter were Freemasons, that Alexander Dumas wrote Airport 79 - The Concorde, and made the very debatable claim that Ronald Reagan was a "friend of the black man." As far as the Krushchev/Nixon alternate world history goes, I think it probably has something to do with the two quotes I used at the beginning of this article, as well as Eddie G.'s fondness for jokes with their punchline in the middle, exemplified by The Aristocrats and The Big Orange Head story. Or maybe I'm just thinking too much.